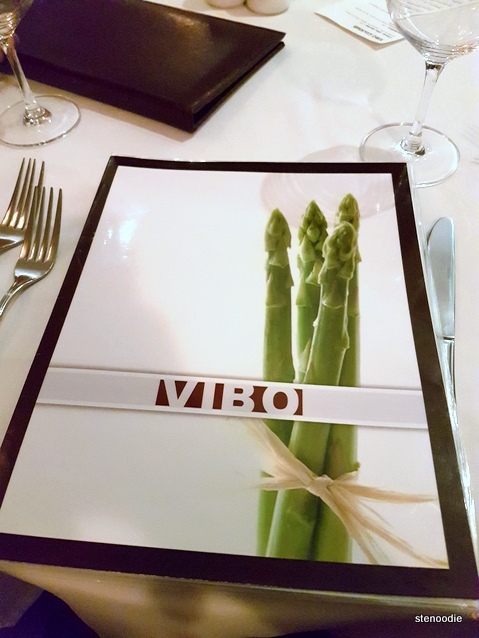 After participating in a restaurant launch party just blocks down the street, some foodie friends and I decided to visit ViBo Restaurant for an actual sit-down dinner. 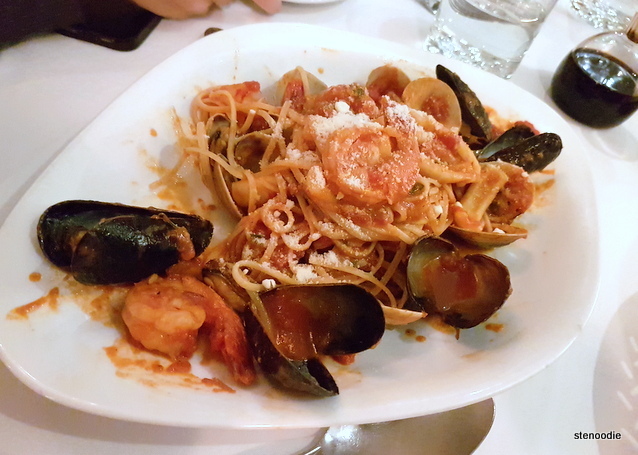 ViBo Restaurant was listed on Yelp as highly rated Italian restaurant that was close by, so the six of us decided to try it without hesitation. 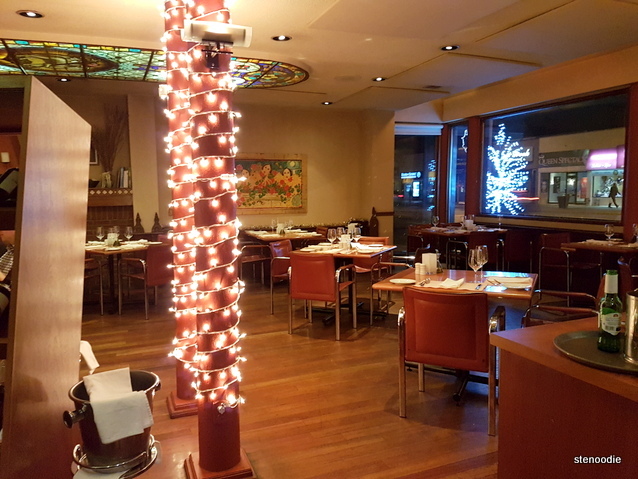 ViBo Restaurant has two levels and it was so romantic and gorgeous inside! There were stained glass windows amidst a modern and cozy atmosphere. 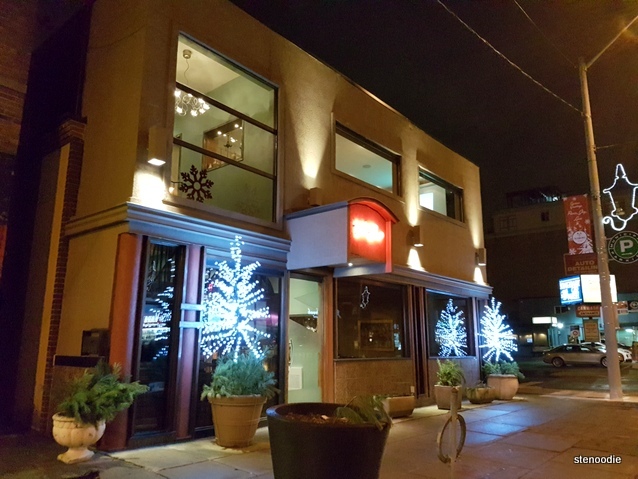 It looked like the perfect place for a holiday dinner with loved ones and especially fitting for a date. The host received us warmly and asked if we wanted to hang our coats on the coat rack. 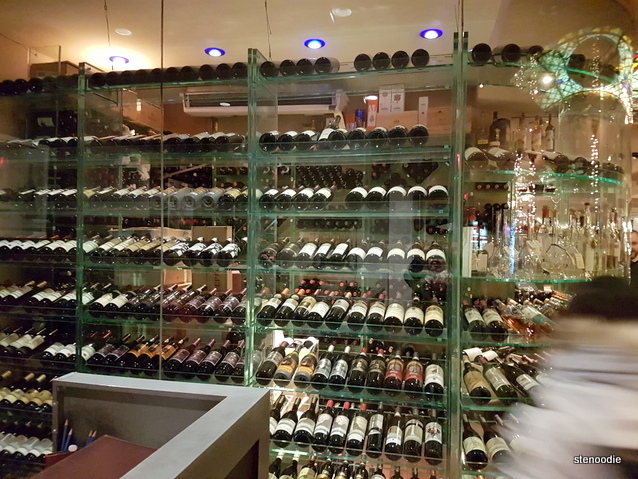 We walked past a gigantic wine cellar that seemed to hold over 200 bottles of wine! It was really impressive and very fancy too. 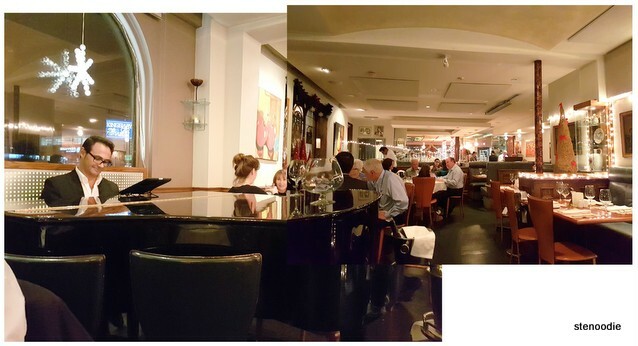 We walked past a grand piano where there was a gentleman playing soft classical music throughout the night and sat down on a white-table clothe table fitted with soft napkins. Again, it was a really romantic and classy restaurant. All around us, people were dining with wine glasses sitting on their tables. 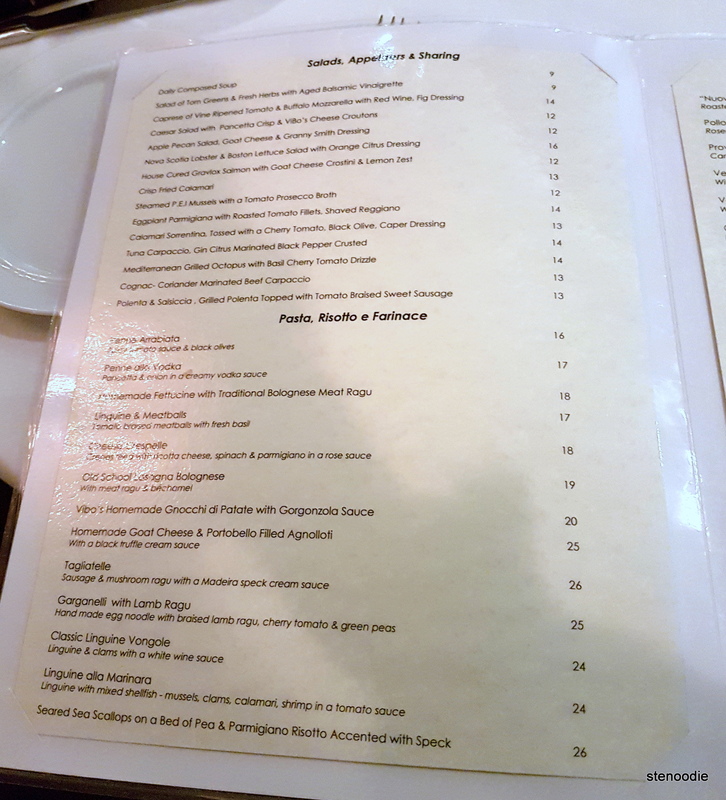 We must have been the outliers that night to just order a main course each with no appetizers or drinks. Anh and I were tight on time since we wanted to catch a movie afterwards back in the heart of Toronto so when we placed our orders with the server, I specified that we had to be out of there by 8:45 p.m. (we walked in at 7:20 p.m. and placed our orders by 7:30 p.m.). The server acknowledged my request (it was also noted on the last page of the menu to inform the staff of any time restraints so it was a good idea that I did). 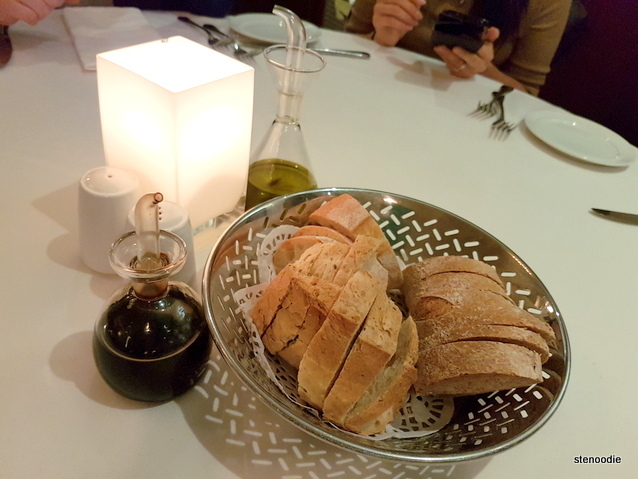 We received a basket of bread to go along with really cool-looking bottles for the olive oil and balsamic vinegar. 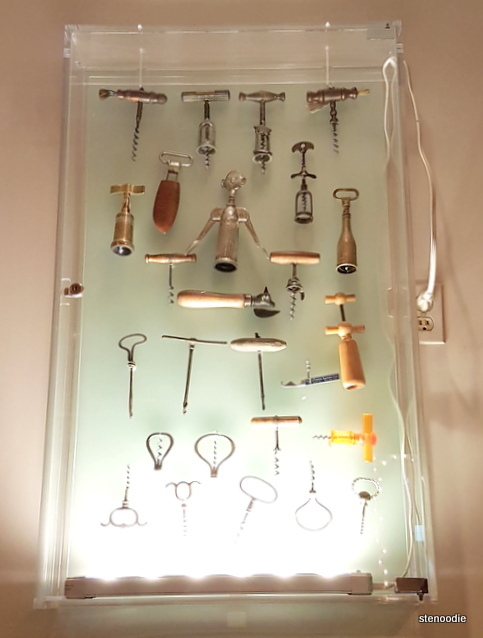 The restaurant had free wifi access and there was a really neat collection of corkscrews that hung next to our table as wall art. 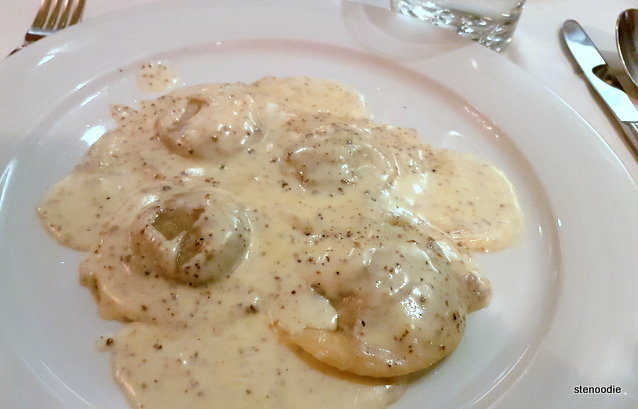 Anyway, I had ordered a Homemade Goat Cheese & Portobello Filled Agnolotti with a black truffle cream sauce. When it arrived, I was shocked to see that it was such a small portion on my plate. There were only four agnolotti on my plate… Compared to the portion sizes that our friends received for their pasta dishes, this agnolotti dish was extremely small. I do recognize that it contained black truffle and goat cheese though — pricier ingredients, but I still felt that the portion should have been more substantial. 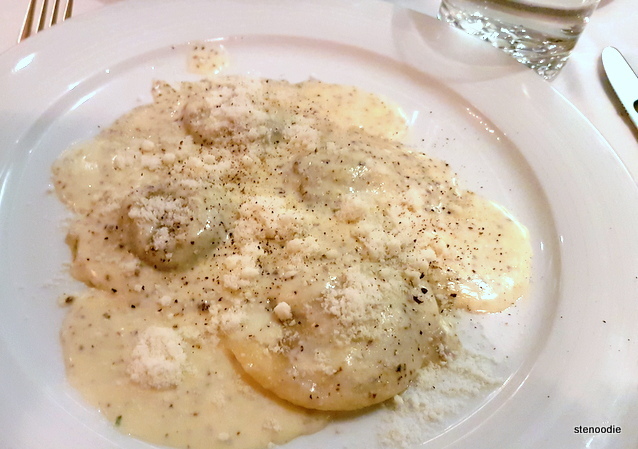 At first bite, the Homemade Goat Cheese & Portobello Filled Agnolotti was indeed extremely fragrant and delicious. 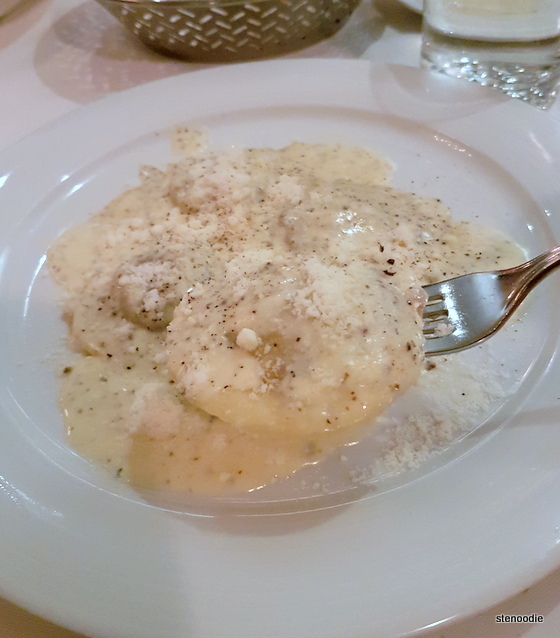 The goat cheese was very fresh and creamy while the black truffle cream sauce wasn’t too empowering. I also really liked the skin of the agnolotti as it was a little al dente and you could taste that it was made with quality ingredients. 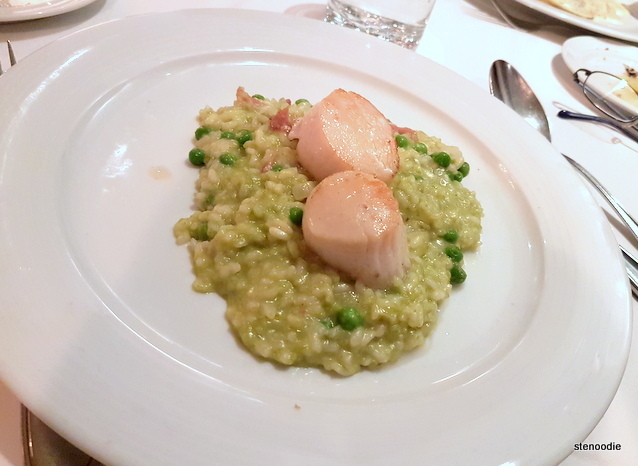 I tried a bit of the risotto from Raymond’s Seared Sea Scallops on a Bed of Pea & Parmigiano Risotto Accented with Speck (lol, what a mouthful of a name) and really loved its flavour. It was delicious! I tried a bit of the linguine from Christine’s Linguine alla Marina and while it was al dente, I thought it was simple in taste — not too flavourful. Same thing for Sarah’s Homemade Fettucine with Traditional Bolognese Meat Ragu (not pictured), but I did really like the bolognese meat ragu. We all finished our food by 8:40 p.m. or so and paid by 8:50 p.m. If it weren’t for the really slow service in delivering our plates of food, I would have enjoyed our meal better. I just thought that if I gave the server a heads up about our limited time constraint that he would have respected our wishes to ensure that our dishes came out in a reasonable amount of time. Unfortunately, because of the slow service, it soured the experience a little bit. 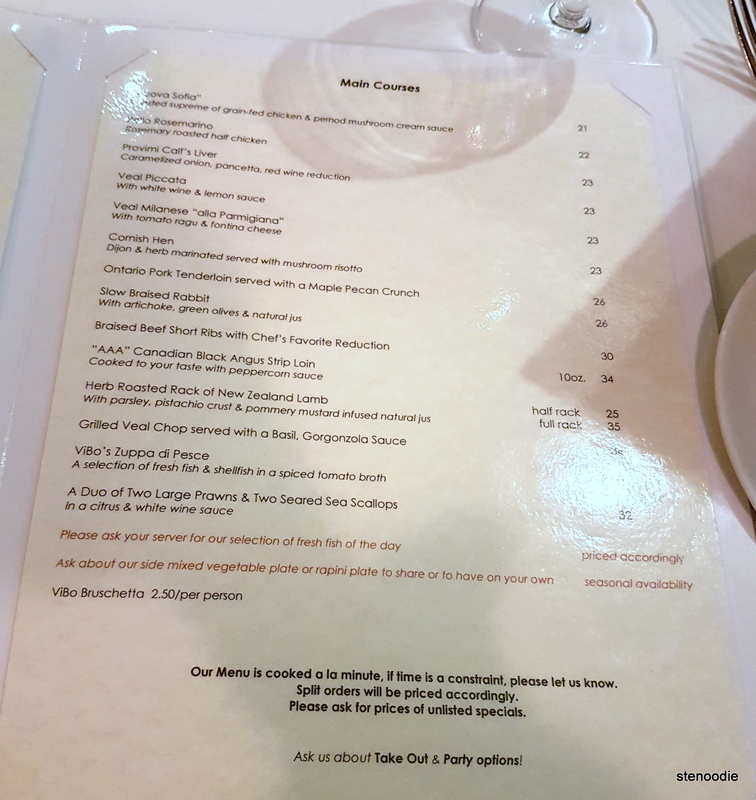 I still think that ViBo Restaurant is a really good Italian restaurant and definitely a fitting spot for a romantic dinner. However, I can’t vouch for them right away due to my current first impression. This entry was posted in Food and tagged 2995 Bloor St W, @ViboRestaurant twitter, Agnolotti, Bloor West restaurants, dinner, Etobicoke, food blog, foodie, free wifi, Homemade Fettucine with Traditional Bolognese Meat Ragu, Homemade Goat Cheese & Portobello Filled Agnolotti, Italian, Italian restaurants in Toronto, Kingsway neighbourhood, Linguine alla Marina, live piano playing restaurant Toronto, restaurant review, romantic Italian restaurants in Toronto, Seared Sea Scallops on a Bed of Pea & Parmigiano Risotto Accented with Speck, Toronto, ViBo Restaurant, ViBo Restaurant dinner menu and prices, ViBo Restaurant reviews, wines. Bookmark the permalink.